Probing the acoustic vibrations at the nanoscale at the gigahertz frequencies is an experimental challenge that attracts a considerable attention. Indeed, a better understanding of these acoustic vibrations is a way to test the validity of the classical continuum theory of elasticity at the nanoscale. Besides, further investigations reveal that the nano-objects vibrations frequencies provide a real acoustic fingerprint to characterize the size, shape or material of the nano-object. It has also been considered that these nano-objects could be used as acoustic transducers to design acoustic microscope with a nanometric resolution. However, up to now, only confined acoustic modes have been investigated. Physicists from the INSP go beyond and design an experimental setup to study the propagating acoustic waves in single nano-objects. In order to study the gigahertz propagating acoustic waves in single nano-objects, we design gold « nanobeams » using the electronic lithography in the INSP’s clean room (Figure 1). These gold nanostructures have a rectangular cross section. Their thickness is fixed to 110 nm, their width ranges from 200 to 800 nm and their length exceeds 15 µm. 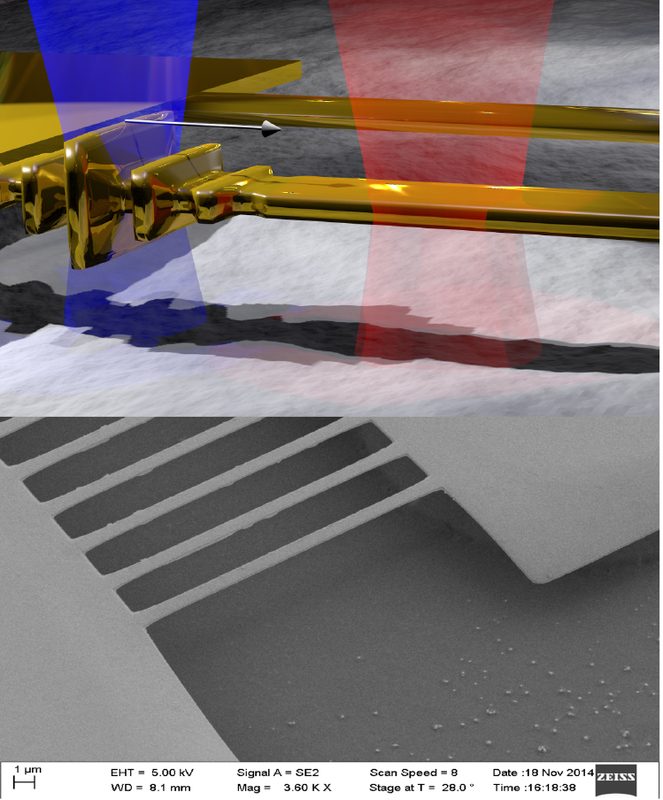 To reduce the influence of the silicon substrate, a chemical etching in performed : the gold nanobeams are then suspended several micrometers above the substrate (Figure 1). By considerably reducing the relaxation channel toward the substrate, this suspended geometry results in a huge increase of the quality factor of our nano-resonators. 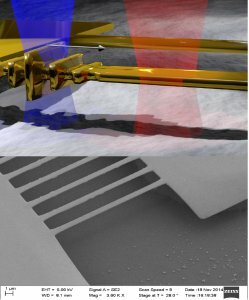 (Top) Artistic 3D view : pump-probe spectroscopy of propagating acoustic waves in a gold nanobeam suspended above a silicon substrate. (Bottom) Scanning electron microscope image of the nanobeams. 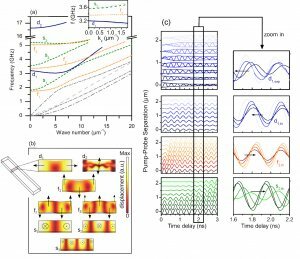 In time-resolved pump-probe spectroscopy, acoustic modes are excited by a femtosecond laser. A very short (100 fs) laser pulse of blue light is absorbed by the metallic structure which heats the electrons. The excess energy is then transmitted to the crystal lattice causing periodic expansion and contraction of the nano-object. These periodic vibrations are monitored via detection of the concomitant changes of its optical response by an other laser pulse of red light : acoustic waves modify the refractive index of the material which modulates the intensity of the reflected light. The probe beam is fixed on a XY piezoelectric stage such as it is laterally positioned with respect to the pump beam. The propagation of acoustic wave packet in single nano-objects is then investigated. Thanks to the propagation, the deduced material properties are more accurate than the characterization of the resonant frequency only. Indeed, the spectral resolution is limited by the strong attenuation of acoustic vibrations in metallic nano-object around 0.5 GHz. Owing to the measurement uncertainties, the experimental mode observed at 3.2 GHz is not identified unambiguously as the three modes d1, f2 ou s2 (Figure 2.a) can correspond to this measured frequency. To circumvent this issue, acoustic modes dispersion relations can be computed and the propagation of each mode is simulated (Figure 2.c). A careful analysis of both the envelope and the phase propagation direction of each simulation with the actual experimental signal results in the unambiguous acoustic mode discrimination. The acoustic mode observed at 3.2 GHz in the gold nanobeam is the width dilatational mode of the beam d1. . This direct experimental observation of gigahertz propagating nanoacoustic waves on a single nano-object emerge as a useful characterization tool that accurately complete the confined modes characterization. 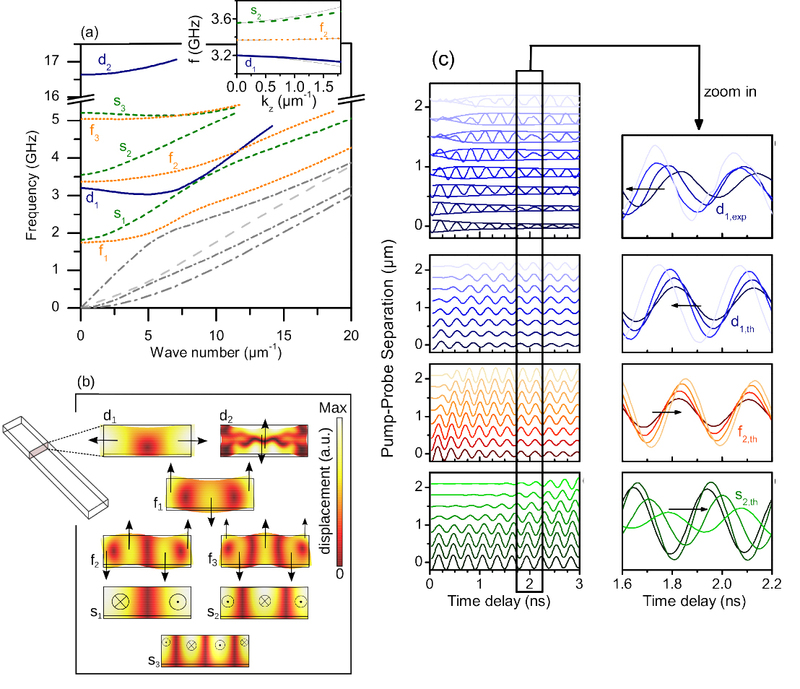 By merging the guiding and confinement of acoustic waves in nano-object, this study paves the way to use nanowires as nanometric lateral size acoustic transducers to synthesize complex wave fronts at the nanoscale and the picosecond time scale.